Comey uses emotive language and sympathy for the victims to gain public support for the FBI’s stance in what is a very complicated matter with potentially huge ramifications for all citizens. Much of the media has also assisted in the oversimplification of this matter, pitching it as a corporation’s callous indifference to the victims of terrorism by refusing a simple request to unlock one individual phone, by giving the impression that all that is required is the cracking of a single passcode. In the abc news interview with Tim Cook this week, the interviewer David Muir repeatedly returned to rephrased versions of the question “How can you sleep at night?” in an attempt to make Cook take responsibility for any potential future terror attacks connected to the San Bernardino shooters. Many politicians, on both sides of the political spectrum, have also reinforced this idea of an obstructive, unpatriotic company refusing a simple request. All the current GOP candidates have called for Apple to be forced to comply with Trump calling for a boycott of the company until they do. It is concerning how many people in positions of power either fail to understand the intricacies of this issue, or choose to oversimplify them in order to gain public support. Amidst this terrorism-filled rhetoric and hysteria, Cook and Apple have worked hard to explain the implications of what is being asked of them and the vulnerabilities that would be created. They have described the software they would have to produce as a master key that could be used not just by the FBI, but also by hackers, calling it “a cancer”. They have also expressed concern that this could be the start of a slippery slope of tech firms being asked by government agencies to create software which could infringe on people’s civil liberties. Their stance has been publicly supported by other tech giants such as Google and Microsoft. 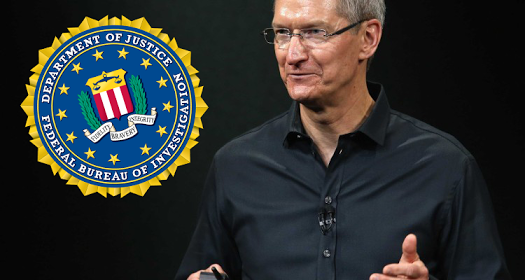 As for the FBI’s assertions that this is a single case which will not set precedents, since their initial statement it has become public that Apple had already provided the FBI with support in trying to access information on the San Bernardino phone, while currently fighting several requests from other law enforcement departments to create ‘backdoors’ for devices involved in 12 other cases. More recently Comey has moved away from his assertion that this case will not be precedent- setting but has stated that it may “be instructive for other courts” when interpreting how far companies can be compelled to assist the government. The Apple case is just another in a list of many stretching over the past 15 years in which the fear of terrorism is being used to gain public support for a political agenda; in this case that of the weakening of encryption to allow intelligence agencies easier access to personal information universally. Since the Snowden revelations, the public have been made more aware of the vulnerabilities of their digital data and companies such as Apple have been developing protections against this within their systems in order to regain customers’ trust. In an attempt to weaken those systems again, the politicians and government agencies now have evoked the ugly head of terrorism again in order to employ pity for the victims to induce guilt from us all that it is our protected information that enables terrorism and encourage us to give up that security. It should not only be Apple who is fighting this battle on our behalf; we should all be standing up against the disrespectful use of terrorism’s victims in leading us passively into giving up our rights to privacy.